Choose from the many wedding packages available to suit your style and requirements. Romantically decorated Overnight stay for the bridal couple at the Mount Lavinia Hotel, with bubbly breakfast in bed or international breakfast buffet at the Governors restaurant. Complimentary day room for arrangements and Bridle dressing. Beautifully frilled table for the cake structure. Antique settee with coffee table. Traditional 5 ½ ft Brass Oil Lamp. Complementary candle lit dinner for your first wedding anniversary on our romantic paradise beach. Modern air conditioned Studio to take photographs and magnificent photo locations. Complimentary pressing of going away attire. 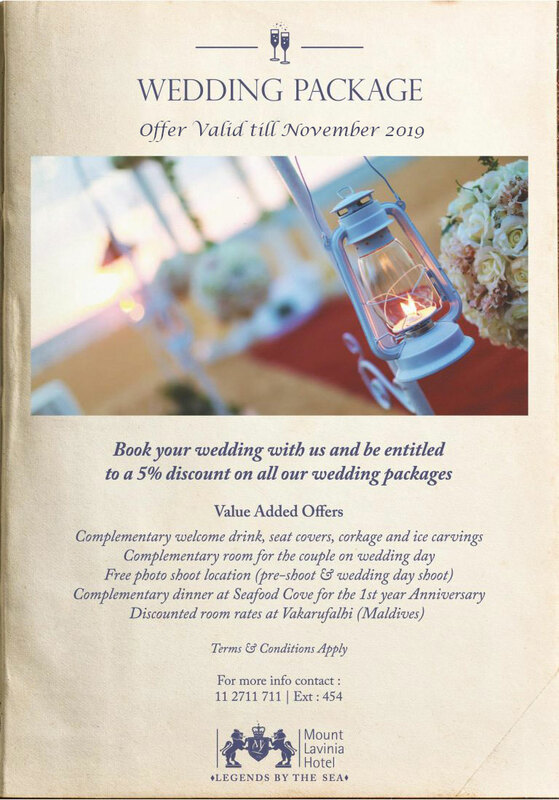 Romantically decorated Overnight stay for the bridal couple at the Mount Lavinia Hotel, with bubbly breakfast in bed or International breakfast buffet at the Governor’s restaurant. Complementary dinner buffet for your first wedding anniversary at our Governor’s Restaurant. Complimentary day room for arrangements and Bridal dressing.